When I’m painting, which is most of the time, there are occasional shifts in the work from day to day. Sometimes they just happen without any forethought, an adding of an element here or there to change the balance of a composition or the touch of a color that may have been absent from the palette for some time. Then there are conscious decisions made in advance of coming work, such as the decsion ot work in a certain size or medium. I came across some older work lately in my archives that made me make such a consious decision. It was a group of mainly nocturnal scenes done in deep gem-like transparent blues. They have a stark and moody feel and, while I always have really thought highly of them, have been out of my repertoire for some time. I’ve got to make an effort to revisit this work and see what emerges. There’s something different in approaching a painting as an examination of solely color rather than as harmonizing a landscape’s composition. The focus on color seems to create its own mood and drama, one that comes across off the wall even in the starkest of compositions. We shall see. For now, here’s a video that speaks to the subject for me. 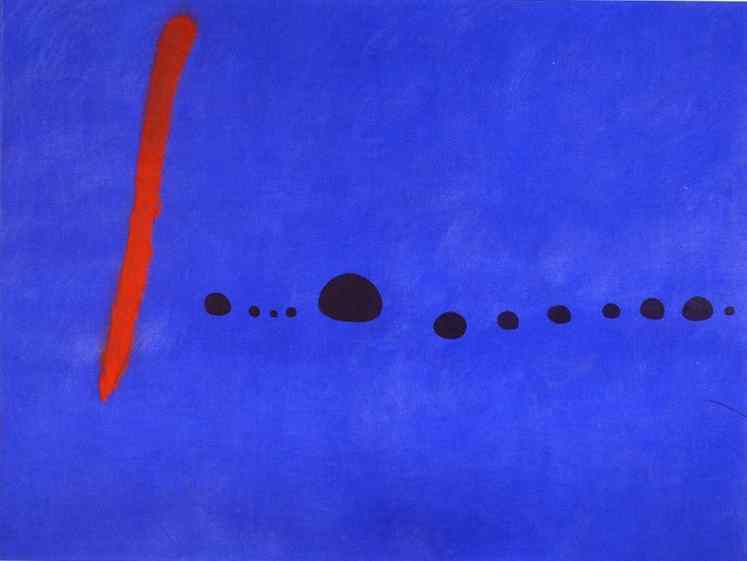 It’s Dave Brubeck’s Bluette played over the wondeful work of Joan Miro. Enjoy.